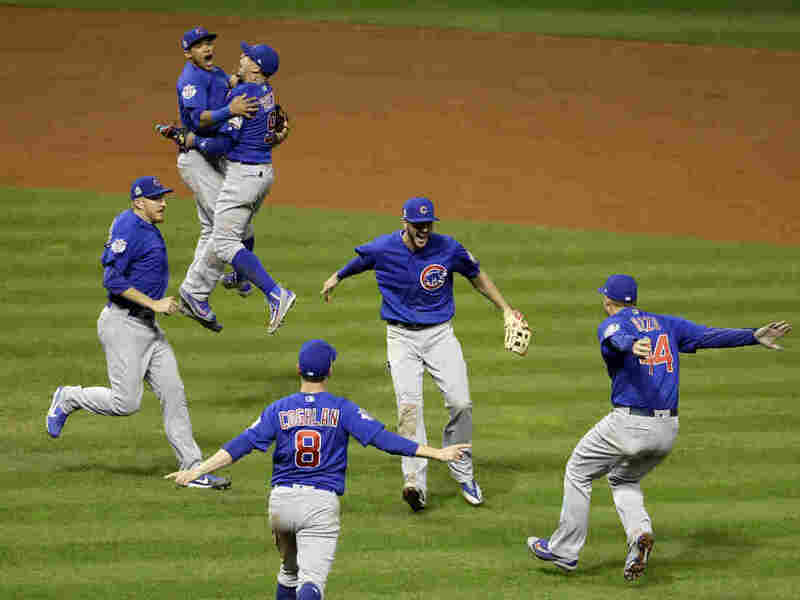 Chicago Cubs Win World Series, Defeating Cleveland Indians 8-7 In Game 7 : The Two-Way The final score in Game 7 was Cubs 8, Indians 7. The Cubs came back from a 3-1 game deficit in the Series and became baseball's champions for the first time since 1908. The Chicago Cubs celebrate after winning Game 7 and the World Series against the Cleveland Indians. The Indians' Jason Kipnis scores, evading a tag by Jon Lester during the fifth inning. The Cubs took the lead early in the first inning and seemed in control of the game before almost letting this one get away. They were leading 6-3 when their hard-throwing closer, Aroldis Chapman, blew a save opportunity by giving up three runs in the eighth inning, two coming from a dramatic home run by the Indians' Rajai Davis that tied the score at 6-6. In the top of the rain-delayed 10th inning, the Cubs' Kyle Schwarber opened the frame with a single and was replaced by pinch runner Albert Almora Jr., who took second base on a sacrifice fly by Kris Bryant that almost left the park. Anthony Rizzo was intentionally walked. Ben Zobrist doubled to score Almora and then pinch hitter Miguel Montero singled to score Rizzo. The game stood at 8-6. 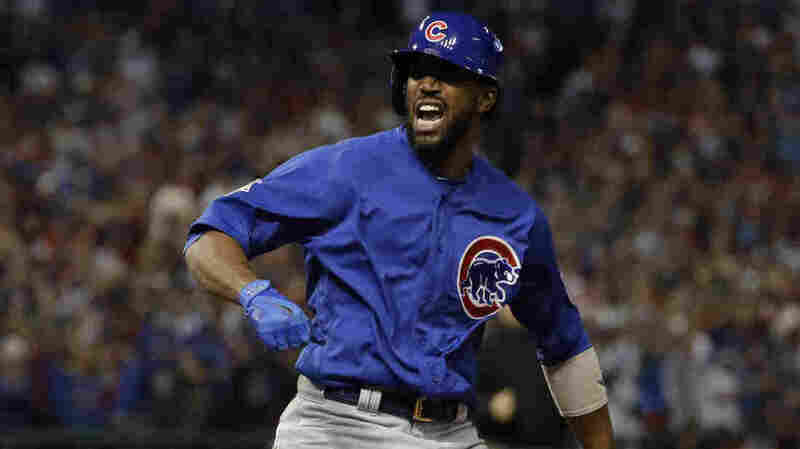 Chicago's Dexter Fowler reacts after leading off the first inning with a home run off Indians starter Corey Kluber. In the bottom of the inning, the Indians threatened again. Cubs reliever Carl Edwards Jr. got two outs from the Indians before walking Brandon Guyer, who stole second base. That brought up Davis, the hero of the Indians' eighth inning. He promptly singled, scoring Guyer. With the score at 8-7, Cubs reliever Mike Montgomery induced Michael Martinez to ground out. The last time the Chicago Cubs won the World Series was 1908, when Theodore Roosevelt was president. By losing in extra innings in Game 7, the Indians fell short of their goal: to win Cleveland's first championship since 1948. The game had no shortage of stomach-tightening moments for both teams and their fans. The Cubs struck quickly in the first inning with a solo home run to center field by leadoff hitter Dexter Fowler, off Indians starter Corey Kluber. Schwarber followed with a single, but Kluber then retired eight straight Cubs over the first three innings. Schwarber collected his second single of the game but was thrown out trying to stretch out a double to end the top half of the third inning. The Indians tied the score at 1-1 when Coco Crisp led off the bottom of the third inning with a double to left, took third on a sacrifice bunt by Roberto Perez and scored on a single to right field by Carlos Santana. An error by Cubs second baseman Javier Baez put another runner on base. But the Indians failed to capitalize on what might have been a big inning. The Cubs regained the lead in the top of the fourth inning, scoring two runs. Kris Bryant led off with a single and Rizzo was hit by a pitch. A sacrifice fly by Addison Russell scored Bryant, then a double by Willson Contreras brought in the Cubs' second run of the frame. The Indians went down quietly in the bottom of the fourth inning. Chicago got two more runs in the fifth inning on a solo homer by Baez on the first pitch he saw from Kluber. The Indians brought in their ace reliever, Andrew Miller. Two outs later, Bryant walked and scored on a base hit by Rizzo. Chicago led the game 5-1. The Indians came back with two runs in the fifth. Cubs manager Joe Maddon pulled starter Kyle Hendricks in the bottom of that inning with two outs after he walked Santana. Hendricks left the game surrendering only one run and scattering four hits. The Cubs' Jon Lester, typically a starter, came in to relieve. A throwing error by catcher David Ross put runners at second and third. Both scored on a wild pitch by Lester, cutting the Indians' deficit to two runs, 5-3. Ross reclaimed one of those runs with a solo home run to center off Miller in the top of the sixth inning, extending Chicago's lead 6-3. The Cubs stayed in command until the improbable bottom of the eighth. They were never behind in this game. A previous version of this story misidentified Progressive Field as Progressive Park.